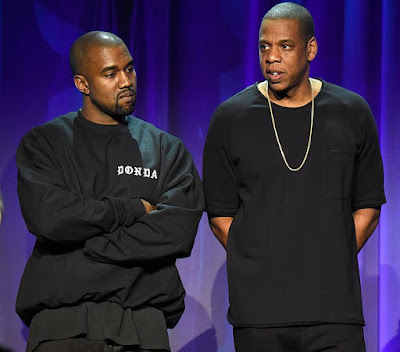 Kanye West has reportedly filed a lawsuit against his former friend Jay-Z's Roc-A-Fella Records and EMI Publishing over unpaid publishing royalties. According to TMZ, the rapper and producer filed two lawsuits against Roc-A-Fella Records and EMI April Music. In his suit against his former record label, 'Ye claims that he signed an exclusive recording agreement with the company and is seeking monies owed from the label. In his second lawsuit with EMI Publishing, Kanye claims that in 2003, before his debut album College Dropout was released in 2004, he signed a contract with them that would allow him to produce songs for other artists. Kanye also claims that he'd written over 200 songs by the end of 2011 and that he gave those songs to EMI before they had a dispute. He’s asking a judge to declare him his rights back to him, presumably to collect royalties. The Gossip site also revealed that Kanye has enlisted the law firm Quinn Emanuel Urquhart & Sullivan to rep him in the case.